I am one of those people who loves a bit of change, if something is broken I really relish the challenge of fixing it or if change is imposed, then I do like the bit where you work out how to make it work. I get accused of being too much of an optimist and its true in that I try not to linger once a decision has been made, I much prefer to get on with stuff. So in some respects, Brexit, no matter what form it takes, should be right up my street, and in many ways it is, but not for the externally facing issues as that is largely out of our hands, what I am looking forward to are the people issues and the challenges they will present. Because I don’t care what anyone says, there are no winners in Brexit, we are cutting some of the biggest divides in our society that has every existed and bringing that all back together is going to take a herculean effort. Its going to take leadership (and I can’t see where that comes from) but its going to involve everyone taking a really deep breath and evaluate our own grief and working out our plan for moving on. Because regardless of what happens in Westminster, we as a population still see this in terms of winning and losing, of them and us. Teresa May will have her vote and the Parties will not be looking at the national interest, it has turned into the biggest political football ever. The Tories are split and infighting. May can barely hold her cabinet together. She has a deal, the only deal on the table, yet no-one seems to be willing to compromise. The backstop is simply a useful issue, if it wasn’t that, then it would be something else. So they are playing a defensive position. The only other real player in this is Labour. Before Conference we had a clear position – The 6 tests. If the deal met all (or most, if Starmer felt like there was some slack) of the tests, then we would not support it. After conference, we had an even clearer plan. We would push for a GE and then Peoples Vote if that failed. But the leadership had different ideas and pushed for the wrong vote of no-confidence. No matter what happens now, there will not be enough time to play the strategy. Now you can ague the if that was deliberate, or incompetent. The point is it doesn’t matter. There is no real opposition to Brexit, it’s a case of Deal or no deal. So that takes it to the point of Brexit is (almost certainly) happening. How do we bring the nation back together? How do we yoke the strength of a nation? I think in terms of national crisis, it’s not going to be at the ports, or the aircraft terminals, but its going to be on the streets. People are still going to have families ripped apart, communities and groups are still going to be remainers and leavers. So, moving on is the challenge, everyone is going to be bitter because the majority will not get what they voted for. How do we suture the wound? How to we become Best of British again? What does a leader need to do? The first thing would be do bring a comprehensive homes building programme. This would hit a number of high points, including Jobs, infrastructure and community. It would also allow a lot of trade training and development. I would also look at the NHS and the integration of Health and Social Care. In particular, I would look at the Pharma industry and how to reduce the research impact of drug development. One of the reasons that drugs are so expensive is the research aspect, so we can use different development models to focus on drug development. A National Drug Development Agency. The crucial bit would be that the drug development would be a national asset. Again, this not only looks at infrastructure, but jobs and education. We do have the ability to have “wartime spirit” and “best of British”, but it needs to be inspired, to have purpose and a common vision. Inspire that and we are on a winner. That’s just off the top of my head, but with my “glass half full” attitude, this could be a catalyst that a leader would grasp for Social Change for the better. As many of us are doing, its nice to take some time to reflect on what 2018 has been like in order to put some perspective about what will make 2019 better. Professionally its been a very challenging but rewarding year. We took some decisions about work to go for on the thinking that if one of them paid off then that would be brilliant, but we had the surprise of both of them coming up trumps, which meant all hands to the decks and delivering the most amount of work that K Sharp has done to date. In amongst all that we moved our office to Llanelli, said goodbye to some of the team members and hello to new ones. This year also gave me the personal challenge of leading multiple teams, and having to learn how to manage my time effectively in meeting both of their needs. Thankfully, both teams are brill, and they are great in supporting me doing my job. Driving 6 hours to and from Cumbria has been a challenge in itself, and somewhat exhausting . But it has been a great opportunity to take in some of the amazing Welsh countryside, not to mention get through some Audio book learning. Politically I had always said to myself that I would be taking time out after the events of 2017. However 2018 has been amazing for meeting new Labour friends and refreshing about why I got politically involved in the first place. In many ways coming to Welsh Labour has had all the challenges of when I joined the party the first time round, not knowing anyone, not realising internal politics, etc. But the climate is also very different here, its much more tuned to the Community aspect, about doing the right thing for people. I’ve already had some great opportunities, from enjoying the Welsh reception at Labour conference, to getting involved in some round table discussions on the local economy as well as working to revive our local Labour branch (I’ve never really worked at a Branch levels before). 2019 doesn’t look like its going to be any less challenging, I am still going to be working in Cumbria for a chunk of time, but the opportunities that we are looking at do seem hugely exciting and if only some of them come off then it will be very cool indeed. Professionally, I am setting us some challenging targets, and I have decisions about what to do with my PhD, as it has been on hold for nearly 12 months, and I have to decide if it’s the right thing for me to do (an hours in the day question) or do I change it to something else, perhaps just get the Masters for now. K Sharp is now 7 years old, its scary to think just how much time has flown. We have dealt with some tough times, but hopefully 2019 is the start of some really growth and opportunity. Politically, this year is going to be dominated by Brexit, but there is little we can actually do about it except roll with things as they are presented to us. I am hoping to get involved in our community more, and in our local Labour party as I hope to be spending more time at home. We are lucky to have a great MP and AM in Llanelli, as well as some fab councillors and members, just getting stuck in will be fantastic. Personally, as I say every year, I do want to blog more, so I will try again this year to do something at least once a month. I need to get back on the running bandwagon, setting myself achievable targets. I want to learn the saxophone (I won’t be forcing anyone to listen), and make an effort to meet more of my neighbours (well not all of them as we live next to a graveyard, but you know what I mean). More importantly, I want to spend more time with my Family. Working away gives you real perspective on missing the simple things and just how much time you lose. And to actually take a holiday this year too. Happy New Year – I wish you all the opportunities of 2019 and if there is anyway I can help you realise them, just shout. I was quite excited last night that we were to have the debate on the Welsh Labour leadership. Given that I am still relatively new regarding Welsh Politics, so far all I have had to really go on is the official output from the candidates themselves. What I was hoping for last night was to hear from people who had experiences of the candidates, about why they were supporting them to help me make a decision. One member immediately proposed one of the candidates for nomination, without any reasoning as to why (which is fine, nothing wrong with that, perfectly within the procedures) and the chair asked if any other proposals were put forward. It was then that I interjected with something like “I hope so, as it’s the main reason I’m here, to hear about all the candidates”. Lee Waters AM, I think, could see where I was coming from because he then did a brilliant job in briefly summing up each candidates campaign and a brief on their history etc. I know that Lee has been supporting Mark for leader, and he did say this throughout the meeting, but it shows a true testament to democracy for him to run through them all the way he did. I was grateful to hear of the different views. I think so in my reading of material, I was leaning more towards Eluned and Vaughan, because I was liking what they had to say on the economy and community aspects. I have only met one of them briefly and that was Vaughan at conference this year. And I have been disappointed in what Mark has been saying on Brexit. However, there was such strength of feeling for Mark last night, and Lee raised some very good items on how Mark had been involved in the “clear red water” of Welsh Labour, and his broad support across AMs, that he is now well back in the running for me. So, when I had hoped to get to a favourite candidate, I’m almost back to the beginning. In many ways I am leaning towards following what other people who I respect in the CLP are suggesting in Mark, but he still has some work to do to convince me, or I have more research work to do to convince myself. So, any thoughts are still welcome, I still need to make my decision. Rise of Extremism, or simply the exposure of real thought? Some of you will know that I have done a fair amount of research into the use (and abuse) of social media and I have always seen the use of it a powerful tool particularly in the realm of politics. Form the rise of fake news (note: the idea of fake news is fake in itself) to the explosion of online bullying. I fear we may be uncovering a problem that is much more deep seated than we would like to admit. However, I have been really interested in social media as a reflection of the rise of polarization of left and right opinion, and the seeming rise of extremism. The current theory is that we see extremism because people are wanting to see a reaction and the only way to see that on social media is to have strong opinions, rather than reasonable and balanced ones. However, I am becoming to think that this may not be true. I have a new hypothesis. I think (fear) that what we are seeing are peoples true opinions that have not been moderated by fair discussion and group challenge. I think what we are seeing is what people really think, and because it is not face to face and people do not have to deal with consequences of hurt feelings, then there is no drive to listen to other opinion, or moderate their own opinion. This is all reinforced by example (Trump) and popularity (likes, retweets, responses). I have no science to back this up (yet) and I hope I am wrong, but i fear we are developing the ability to shout without moderation, to hurt without consequence, to hate unconditionally! As the Brexit deal seems to be imminent, Labour seems to have 2 policies at the moment, force a General Election, or force a Peoples Vote. Obviously the third way is to take whatever we can get in terms of the deal. Given the fixed term parliament act then the Tories are unlikely to make the same mistake they made in 2017, or if they do push for it, they are going to be much better prepared. However if they do offer a GE, should Labour even accept it? This is very much the Tories mess, should Labour let them get on with it, complete their Brexit, let them own it. So I don’t think we should push for a GE before Brexit – really what would we do with it? Unless we have an amazing plan, then we will be lumbered with having to deliver a rubbish Brexit, which has no plus side in terms of outcomes. We should push for the Peoples Vote, but start looking beyond Brexit too. We need to start looking at what a Labour Government would do in a post-Brexit world. We are well set up for this, we have our 6 tests and we have our mandate from Conference. What we should be doing now is to determine from the EU what the art of the possible would be post Brexit. What would we be able to do to make the best deals for residents, particularly current EU residents in the UK, the best trade deals, the best cultural deals. We should be ready to make the most of the position we will be in and show how an “open and inclusive” approach will be possible, practicable and the right thing to do. This is an ideal opportunity to show how Labour values can shine through on the international stage. So having moved to Wales this year, my rather chaotic year has meant that I am somewhat worried that I simply feel very unprepared for the Welsh Labour leadership contest. With the contest officially open and there being 3 contenders: Mark Drakeford, Vaughan Gething and Eluned Morgan, we are now in a one member one vote situation. The Ballot will be in November, so I have a month to make a decision. I think I need to determine what I want out of a welsh leader, and straight off the top of my head I want someone who can drive party unity, look strongly after our interests during the farce that is currently Brexit, to drive a positive industrial strategy that sees things like Swansea Bay initiatives see a green light, not a red one and drives a positive approach to the health needs of our communities. So, whilst I will be doing my own research, I would appreciate other peoples views. Either comment below, email me or message me with your thoughts, experiences and views. So, after a lot of thought and debate over the past few months, I decided to come to conference. On the one hand, I have met some fantastic new Labour people in Wales, and already made some firm friends (which is partly what it should all be about) but conference is also going to be a stark reminder of all the things that perhaps I’m subconsciously blocking out. I think this conference will be a big deal for everyone in the party, but for many different reasons. Already out of women’s conference we have one MP praising the work of Militant influenced Labour Council in Liverpool, some will be cheering that, seeing civil disobedience as a way forward, indeed it has been strongly encouraged by members for Labour councils to set illegal budgets etc, but fundamentally I believe that is the wrong thing to be praising. Indeed the rule-book itself had to have the addition that stops Local Labour councils setting illegal budgets. However on the plus side, the announcement that Domestic Violence Survivors will be entitled to 10 days paid leave is a good idea. As always the devil is in the detail and I look forward to see how this will work without unintentionally making things worse, but I’m sure we can work all that out. he language is important here too, we are talking about survivors and not victims, it may seem subtle but it makes a difference. I’m excited to be going to some of the welsh events that I have not been able to go to before, and hopefully catch up with colleagues from the South West and elsewhere. However it is not the same as usual as many members are simply not coming, not wanting to engage with what the Labour party seems to be evolving into. 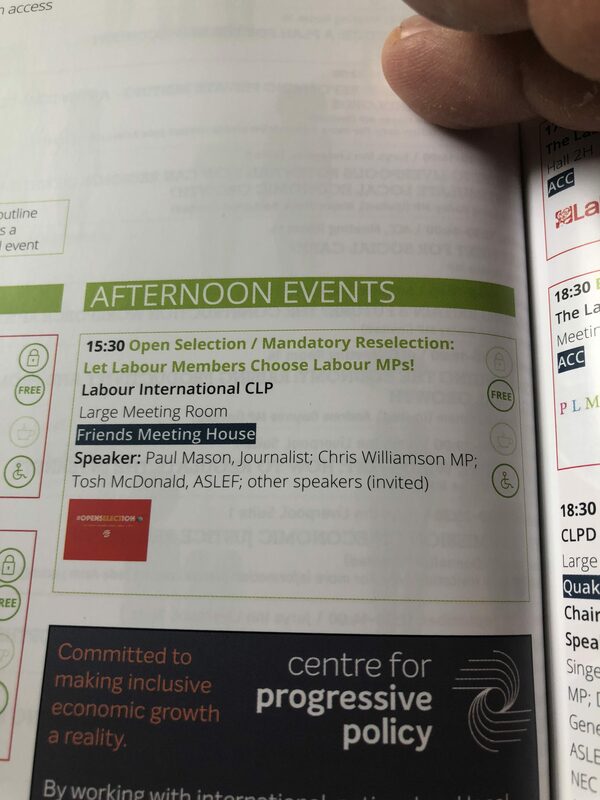 The fringe events have a broad range of topics, which is always good to see, however I am very disappointed to see two events, one being focused on MP de-selection (by, of course, Chris Williamson) and a fringe by Sinn Fein. On the plus side, I see some interesting debates in Defence, Business and policy around developing communities. (Oh and the headline was inspired by the fact that Liverpool is apparently playing tonight, and already round the docks, that’s what you can hear). Its been an awfully long time since I have blogged, and that is mainly due to being incredibly busy and having gone through some huge but exciting changes in our lives, therefore I will give you a quick overview of what we are doing now,especially if you are wondering why you don’t see me in Gloucester anymore. After the many and varied events of 2017, some very positive, some very negative, some amazing and some just plain nasty, we looked at what we were doing and what we wanted to achieve as a family, and what our opportunities were. We always had plans to move to somewhere with a big garden, for those of you who visited us in the Noake in Hucclecote, this is what inspired us to what we could do, living a bit of the good life which chickens etc. After an inspirational visit to Pembrey Country Park and the news that the Severn Bridge Toll was to be reduced and removed as realised that suddenly South Wales could provide an opportunity, one we had not considered before, and then a look at the house prices and what you could get for your money was somewhat of an eye opener. I won’t bore you with the trials and tribulations of what came as the quickest house purchase we have ever had, but everything fell into place, and as much to our surprise as anyone else we moved to a small mining village outside Llanelli, between Christmas and New Year. So now, in February, we are unpacking boxes, and making our new house our home. This isn’t helped by me working on a project through the week in Barrow-in-Furness, but we are making the most of things. But what of politics? We have moved to a fab Labour area, so I am looking forward to getting stuck in. Many of you know that it is community politics that believe is the foundation of things and I think there are huge opportunities to get involved in our new local community. A couple of weeks ago was our first community litter pick 🙂 So after the amazing opportunity to be a Parliamentary Candidate last year, and the awful experiences I had afterwards, then I feel I have learned a lot about myself and others that I will take with me. So if you are in South Wales then do come and say hi, we will always have tea, coffee, cake, wine and/or beer, and a place to crash, you would be more that welcome.